I’m a simple type of guy when it comes to shoes; no fancy Nikes or Reeboks that have gels or springs and cost over 100 bucks. I’m a Vans guy — I’ve been wearing them since high school. 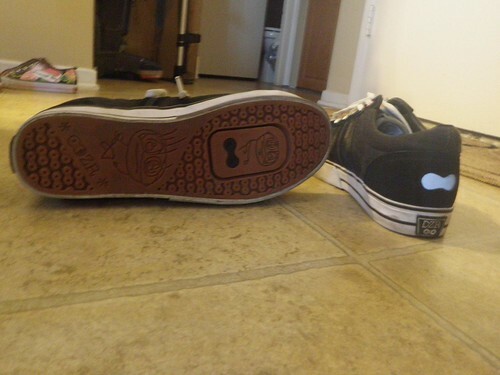 Cool thing is, Vans haven’t gone out of style, they are inexpensive and they come in hundreds of styles. So when RL told me that he had some shoes for me to test that have the same style as Vans shoes AND are SPD compatible, I got excited. So here they are, these are the DZR GMT-8 Urban Cycling Shoes. Check them out, they are beautiful and simple. The DZR GMT-8 have nifty details such the reflective rear badge, chain link sole and two- tone design. Before I installed the cleats, I wore the shoes for a couple weeks, I wanted to see how comfortable they felt and wanted to break them in. The shoes fit me just right, their width was adequate for my feet and I didn’t feel any funny bumps on the bottom of my feet. These shoes are outright comfortable. Installing the Cleats was a straight forward process. I simply cut out the plastic cover, screwed in the cleats and I was ready to rock. Notice how the cleat does not protrude at all, this means no click-clack noise that is incredibly annoying when you wear standard road shoes. I was concerned that the comfort level was going to change after I installed the cleats, I’m happy to report that installing the cleats did not change any of the comfort characteristics of this shoes. They are still super comfy. So how did the DZR GMT-8 perform as a road shoe? Right off the bat I had a few concerns; the long laces, the white toe area and the softness at the top of the shoe. 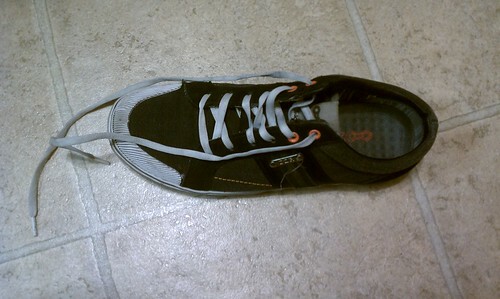 The shoe lace concern proved to be wrong, I never had issues with the laces getting tangled on the crank while pedaling. I did make sure that my shoe laces were quite tight. The white area of the shoes got quite dirty thanks to all the riding and walking I did in them. If you like your shoes looking like new, you are going to have to clean them often. The DZR GM-8 shoes provide adequate stiffness on the sole area, you could easily forget that you are riding with cleats. But if you are a roadie or if you use road cycling shoes you will notice something off about the DZR GMT-8 shoes; the shoes lack stiffness on the upper area. Although this makes the DZR GMT-8 shoes quite comfortable, they do sacrifice power transfer while pulling on the pedal stroke. This is not a big deal for non Cat 6 commuters but if you are looking for these shoes to be high performance road shoes, they are not. What this shoes are, these are awesome shoes for those bike commuters who don’t want to carry extra shoes but must ride with cleats. The shoes look great on and off the bike (just leave your TdF lycra kit at home) and they are very comfortable on and off the bike as well. 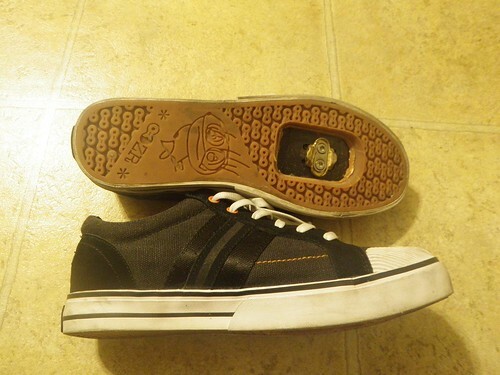 With a price point of $85.00, I consider the shoes to be a good value due to their versatility and comfort. I highly recommend them. DZR offers more styles and colors of shoes , please visit their website at www.dzrshoes.com for more information. “they are inexpensive” and “a price point of $85.00” are at odds. i’m still upset that i have had to bump my price point from “the best there is for $20” to $35. and unless you are o/c, laces will floss your chain ring. 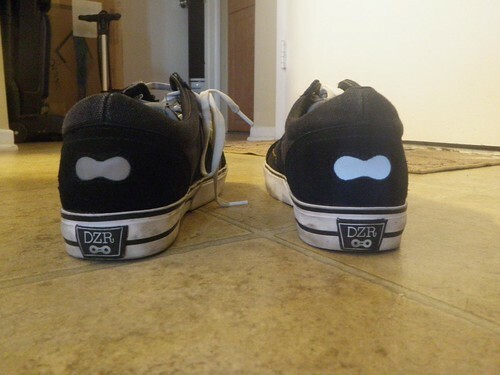 I referred to Vans being inexpensive and the DZR shoes a good value. There is a difference. At $85, the DZR shoes are still cheaper than your gel or spring loaded big brand shoes. 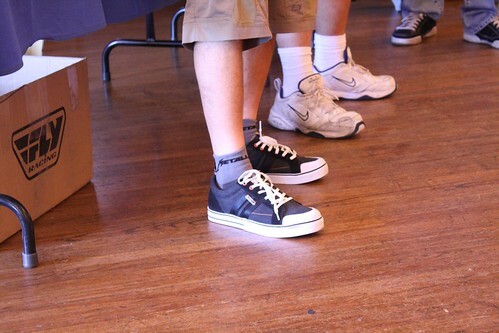 Why is it that the cool shoes never come in wide sizes? @shaun. Yes, the shoes I have are a size 9US and fit me just like my other size 9 shoes. so nice to finally read a good review (as in, something besides marketing) of these. i’ve been thinking about getting a pair since i heard about them, but was unsure if they were either a compromise that was the worst of both worlds or just uncomfortable to ride in. what kind of riding were you doing in them mostly? road or off road? and which crank bros pedals were you using? it seems like softish shoes + eggbeaters + spinning = crazy hot spot. @Brad. I ride mostly road with these shoes. I’m riding with Candy C pedals, no hot spot whatsoever! road with candies, that’s exactly what i’d be doing in them. recently saw a pair in person and really made me want a pair. next bike-related expense. I’ve bought them two days ago. I confirm they are very comfy and they don’t make noise on the floor when you walk with them. The soles are quite wide, they’ve touched the crancks of my bike the first time and I had to adjust the cleats leftmost but they are perfect to ride across the city and walk in town between two rides. What would these be like for fixed gear riding? Louis — there’s nothing inherently “different” riding geared or fixed, at least as far as shoes go. And, considering many fixed-gear riders often wear soft-soled sneakers, these DZRs would seem to be a huge improvement in getting some power to the pedals. These are great, but not very durable. Mine fell apart after just one year of ownership. You get what you pay for, I guess.